The team here at Gosch Toyota in Hemet, California invites our Menifee neighbors to our new and used dealership to learn more about the 2019 Toyota Tundra that is now available! Boasting an array of amenities, impressive performance specifications, and a driver-friendly price tag, all drivers in the area are able to secure the reliable truck they've been looking for. Get a feel for all the 2019 Tundra models that are available, shop our dealership's inventory via our website now! When you're ready for a more hands-on experience of all the Tundra has to offer, visit us for a test drive! Loaded with technological advancements, the 2019 Toyota Tundra is able to keep you entertained and connected while you take on all that nearby Murrieta, CA has to offer. Utilize the backup camera to reverse your Tundra confidently and take advantage of the Entune™ Premium Audio with Integrated Navigation to get directions to unfamiliar locations or to stay hands-free with your Bluetooth® equipped phone. The dual-zone automatic climate control feature works to keep both the driver and front seat passenger comfortable while the 4.2-inch Multi-Information Display keeps track of pertinent driving information. 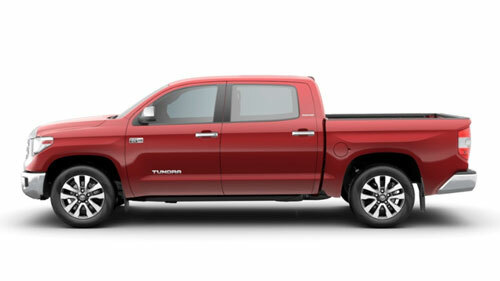 Don't choose between a truck that tackles your towing and hauling requirements and one that provides for your on-road safety, secure a 2019 Toyota Tundra from Gosch Toyota to enjoy it all! This Tundra comes standard with Toyota's Star Safety System™, which features a range of braking and traction features, and offers both a Blind Spot Monitor and Rear Cross-Traffic Alert. Boasting eight airbags and a LATCH system for your young children, the Tundra is able to transport you and your family members safely. Visit our dealership to talk to our professional team members about the comprehensive Toyota Safety Sense™ P system that comes standard on your new 2019 Tundra purchase as well! Start shopping Gosch Toyota's current online inventory now to find a 2019 Tacoma pickup or another new Toyota for sale! You can get pre-approved for an auto loan and see our Toyota lease offers as you shop here on our website. Remember to visit our Toyota dealership in Hemet, CA to test drive a sporty Tacoma pickup truck at your earliest convenience! We proudly serve drivers near Riverside County, CA.